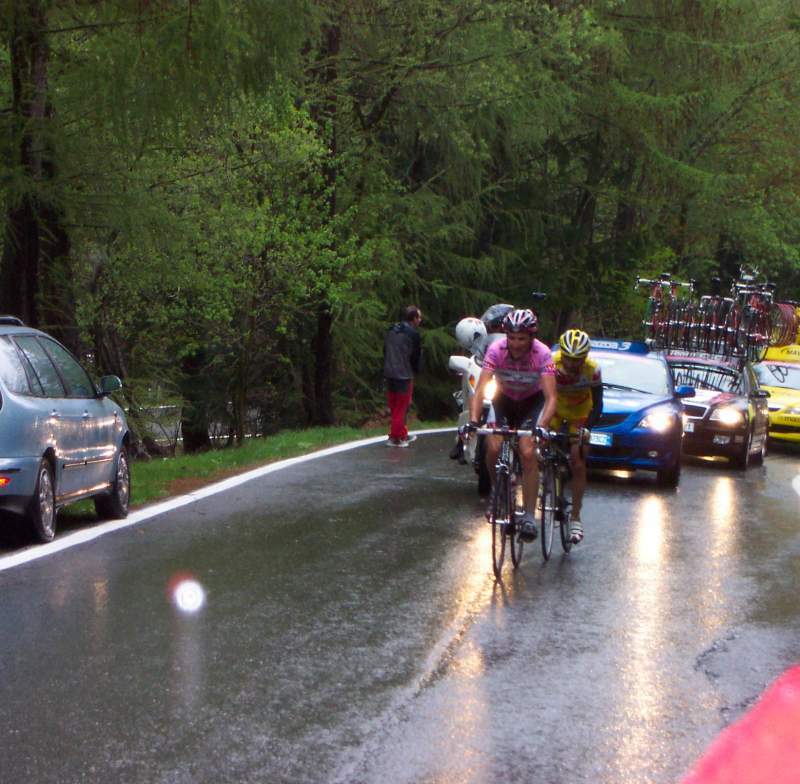 come da programma, il giro d'italia e' passato davanti alla mia baita. Il tempo variabile gia' al mattino e' peggiorato nel pomeriggio, rovesciando secchi di pioggia sulle persone che aspettavano il passaggio dei ciclisti. Erano in molti che gia' dalle 8 del mattino si sono piazzate ai bordi della salita del Col San Carlo, in attesa del giro che sarebbe poi passato alle 16.30 - 17 circa. Sono rimasto stupito dalla velocita' con la quale sono passati questi ciclisti. Nella foto i primi a passare, Basso e Piepoli (quello in giallo che poi ha vinto). Velocita' che io faccio andando in piano (se non in discesa) e sicuramente non farei dopo 200 km o 5 ore di pedalate. Hi Jishu1972 san, thank you very much for your response to my earlier comment "Everything will change for remain the same." sounds very interesting. It seems quite true. I think I can imagine the situation in your country from what you wrote. Oh... I wish to understand what you wrote here, too. Cycling is a very popular in Italy, isn't it? Of course, the most popular is "calcio" in your country and the world cup in Germany will soon start. Another big event after the Olympic games in Torino ! The Italian team is always very strong and attractive. A lot of Japanese people look forward to their exciting plays. By the way, after you intruduced the existance of "youtube" site on March 3rd, we have been enjoying many films of Fumie Suguri's performances. Some of them are very precious ones and we appreciate them a lot. Then we often exchange our opinions about what we saw on that BBS. Once again, I would like to thank you for this. I found that some people who visit that BBS have a good command of English including Fumie. So just in case you might have something to talk about there, your few Japanese words are more than enough. I guess the Japansese words you know should be more than the Italian words I know. You are most welcome as it would make the communications on the BBS more active and fun.